In the last entry about caramelized pudding cake, i did said that we had nasi lemak.. and here is the photo of what we had that day... I did put fenugreek seeds (halba) in the nasi lemak. 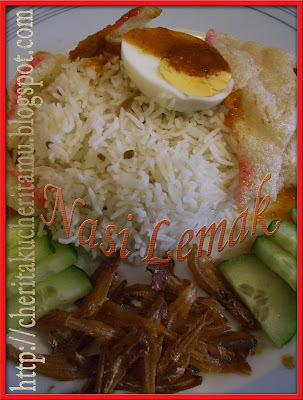 We had this nasi lemak with sambal tumis, boiled egg, fried anchovies, prawns crackers and some cucumber fro breakfast. For lunch, we had this with grilled sea bream marinated with sambal tumis... haha... but no photo to show you all... we're too slow with the camera and too fast with the fish..hahaha..